The bulk of my knowledge about World War II encompasses the American and British homefronts. In my recent study of the battlefronts, I now understand why the conflict was called a “world war.” There were nine theatres of war that literally crossed the globe: African and Middle Eastern, Mediterranean, Western, Atlantic, Eastern, Indian Ocean, Pacific, China, and Southeast Asia. I have also come to appreciate the strategic thinking and coordination required to overcome the Axis powers. Churchill, Roosevelt, and Stalin each had their own idea about the order in which battles should take place to defeat the enemy. And until November, 1942 each had led his army accordingly. 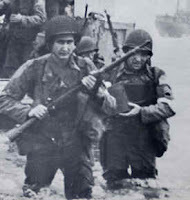 But then came Operation Torch, a campaign that was the first time the British and Americans had jointly worked together on an invasion plan. According to all reports, this coordination was a long time coming. western sector. The British did not feel strong enough to attack Germany via France, but the Americans felt an invastion of France would be successful. Ultimately, Roosevelt did something that British Prime Minister Winston Churchill was never to do during the entire course of World War II. He intervened and overruled his military advisers. 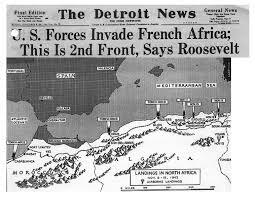 Roosevelt gave his generals a direct order to support the British proposal for landings along the coast of French North Africa. Some analysts postulate that this may have been the most important strategic decision that Allied leaders would make. This amphibious operation inevitably postponed the landing in France until 1944, but at the same time it allowed the United States to complete mobilization of its immense industrial and manpower resources for the titanic air and ground battles that characterized the Allied campaigns of 1944. From North Africa, the plan was to invade Sicily and then on to mainland Italy and move up the so-called “soft underbelly” of Europe. Victory in the region would also do a great deal to clear the Mediterranean Sea of Axis shipping and leave it more free for the Allies to use. 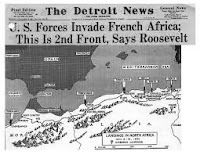 Thus, an invastion of the French-held countries of Morocco and Algeria began on November 8, 1942. By November 10th the battle was over with French forces surrendering. Soon the Allies were on their way to Tunisia.